In the heart of the booming city that is the business centre of the BC Interior, a new industrial strata opportunity is taking form. IntraUrban Enterprise will be home to a select group of businesses and owners who realize the potential for business development in the spectacular Okanagan Valley. There is a rapidly-closing window of opportunity for businesses to invest in their own commercial property in central Kelowna. This lakeside jewel is quickly being discovered, and strata-titled light industrial space is becoming more and more rare. IntraUrban Enterprise offers you a prime location, close to everything business needs. Judged purely on growth, Kelowna is clearly a success story. But development has matured beyond retirees and sun-seekers. High tech companies, entrepreneurs and educational infrastructure, such as the spectacular new UBC Okanagan campus, are leading a long-term investment trend that shows no sign of slowing. Downtown Kelowna is experiencing a renaissance that will serve the entire region far into the future. 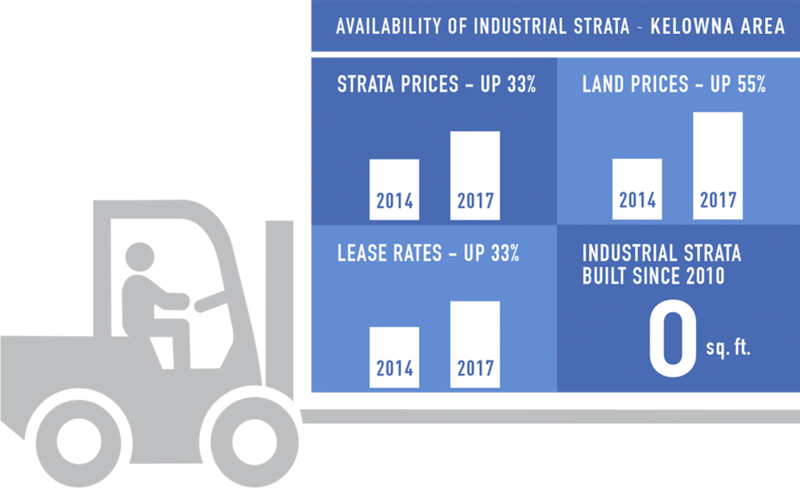 Adjacent to this evolution, near the largest retail centre in the area, IntraUrban Enterprise offers one of the rare strata-titled industrial ownership opportunities. Almost too good to be industrial. Many come to Kelowna seeking relief from the real estate pressures of Greater Vancouver, where increasing real estate values have practically squeezed small and medium sized business owners out of the property game. But In 2016, the rules changed with the launch of the first IntraUrban Business Park in Vancouver, selling out in a few short months. Developer PC Urban Properties Corp. is continuing to build the IntraUrban brand for the small and medium-sized business owner, with industry-leading design, the best strategic locations and amenities designed for leading businesses. Designed to set a new standard for industrial. Many business parks seem to forget one thing – actual people have to work there. IntraUrban Enterprise has been architecturally designed from the ground up for the needs of modern business. 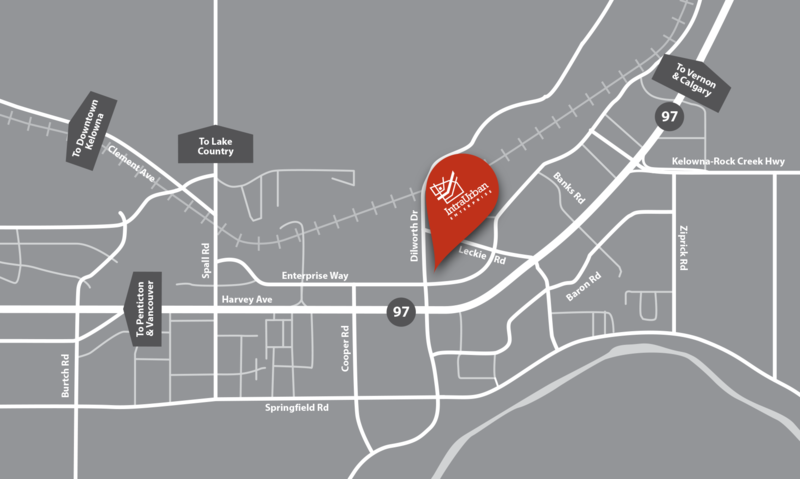 Location is more than strategic – it’s human, with retail and services close by and downtown just minutes away. The units feature extensive glazing, unique architectural façade and wide span structure for efficient layouts. Best of all you can customize your business space because it IS yours. Now, and for as long as you want it. IntraUrban Enterprise is one of a rare breed; centrally-located Okanagan industrial strata. IntraUrban Enterprise. In the heart of BC’s Okanagan paradise. As Kelowna grows, industrial strata opportunities become more rare. This lakeside jewel in the heart of BC is quickly being discovered by the world, and this is putting even more pressure on industrial land values. Lease prices are increasing and strata prices have risen by 33% over the past 4 years. Forward-looking business leaders seeking pride of ownership and stability are faced with fewer and fewer choices. Anyone in business knows that building on your own equity always beats paying someone else’s mortgage, but IntraUrban Enterprise is an opportunity only select businesses will be able to capitalize upon. Be among the first to receive plans, updates and priority launch information.